Lodging happens when the stalk breaks below the ear. This means yield losses, increased time to harvest and may also influence the grain quality. Lodging usually occurs in the second half of the season as the maize plant starts to mature. Hard rainstorms accompanied by strong winds and/or hail late in the season can cause severe lodging even on a healthy crop of maize. There is little that can be done to prevent this type of lodging. Unlike severe weather, the other factors influencing lodging can, to some extent, be mitigated by improved management. Stalk borer infestation, where the worms eat tunnels into the stalks or ears and cause weakened stalks, often results in significant lodging and cob drop. Improved stalk borer control and the use of stalk borer tolerant hybrids can help reduce this type of lodging. Nutrient deficiency, particularly potassium and nitrogen, can increase lodging. A plant that is deficient in these nutrients will relocate nutrients from the roots, stalk and leaves into the developing ear during grain-fill. This weakens the stalk and roots, making the plant more prone to lodge. The fourth major cause of lodging is stalk rot. Stalk rot is caused by infection by a complex of different fungi. This infection decreases the maize plant's ability to resist external stress by weakening the stalk tissue and results in a plant that is more susceptible to stalk breakage. Stalk rot symptoms usually appear after flowering. Stalks become spongy and are easily crushed. The internal pith disintegrates, leaving only the vascular bundles and the outer layers of the stalk. This weakens the stalk, predisposing plants to lodging during strong winds and rain. 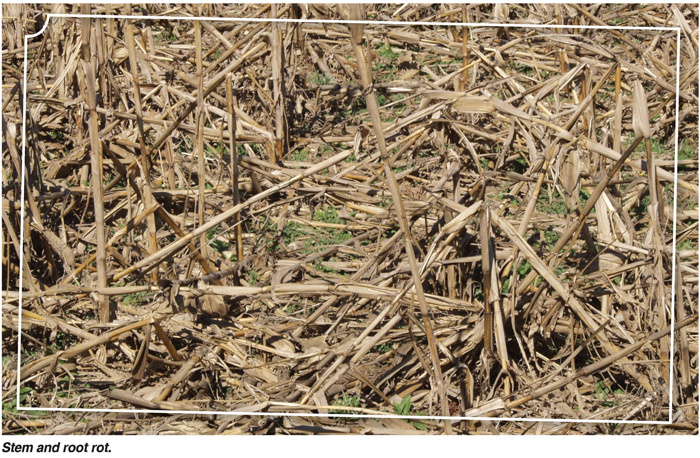 The occurrence and severity of stalk rot in any given field depends on the susceptibility of the maize hybrid, the presence of the stalk rot organisms and an environment conducive to formation of the disease. These three conditions, the host, the pathogen and the environment, must be present simultaneously in order for stalk rot to develop. All three can be partially controlled by management. For example, you can choose hybrids with good disease resistance, or you can partially control the growing conditions with management decisions. Managing lodging in maize is critical to a successful crop and effective harvest. Farmers are encouraged to take careful consideration of the factors discussed above and implement relevant management practices to help reduce the risks of lodging as far as practically possible. There is little more demoralising than being faced by a field of severely lodged maize plants! Article submitted by Grant Pringle, Product Agronomist, Pannar. For more information, send an email to grant.pringle@pannar.co.za.